Back in November we reviewed the Lavatube when it first came out. First impressions were good, especially for a variable voltage tube mod at less than $100. Since then, the Lavatube has become commonplace in the vaping community and is sold under various names by quite a number of electronic cigarette vendors. Overall, the experience with the Lavatube seems to be good and the unit tested in the initial review is still going strong. Some users have experienced quality control issues and others are simply turned off by the somewhat cheap look and feel of the device with its plastic caps. The chrome Lavatube is the newest variation to hit the market and it is a much nicer package than the original, but with the same circuitry. That circuitry is limited to 2.5 amps, meaning that the full 6v capability of the device can only be reached with higher resistance atomizers and cartomizers. In practice, however, the device delivers a decent 3.6-3.8v with a low resistance cartomizer attached, plenty enough for many electronic cigarette users. 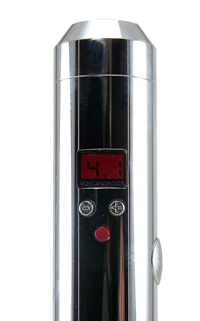 Where the chrome version of the Lavatube improves upon is predecessor is in the area of design. If it weren’t for the fact that the buttons and display are exactly the same, it would be difficult to tell that this device came from the same bloodline. Gone are the plastic end caps and powder coated finish. They are replaced with a shiny chrome exterior with matching steel end caps. The top cap incorporates the sole engineering innovation on the new Lavatube, and it’s a good one. Replacing the simple 510 connector is an eGo connector recessed into the cap, making the chrome version completely compatible with all eGo as well as 510 accessories. 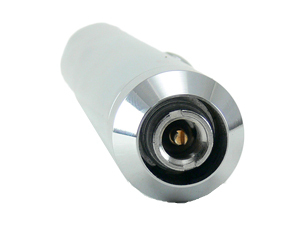 Another great addition is a spring loaded center pin that promises to eliminate atomizer and cartomizer compatibility issues that plague many devices. The chrome Lavatube feels more substantial as well. At 5.95 ounces including a battery, it’s a full 2.5 ounces heavier than its predecessor. The added weight makes the device a little heavier in the pocket, but gives it the feel of a more expensive device when in use. The flawless chrome finish also gives the unit a much more pleasing appearance. The chrome Lavatube performs exactly the same as its predecessor, which is to be expected given that the internal electronics are carried over. Three buttons make it easy to set the voltage, check the battery charge and turn the unit on and off. As mentioned earlier, the 2.5 amp limit carries over as well. While some more expensive variable voltage devices shut off when the limit is reached, the Lavatube simply limits the voltage. 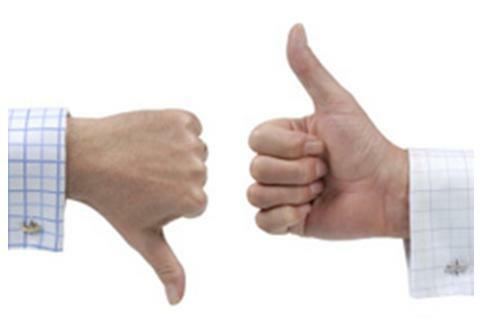 Vapers looking to use high voltage in conjuction with low resistance will need to look elsewhere, but most users looking to step up from typical 3.7 volt eGo type devices will likely find satisfaction. The only real difference in experience is a somewhat airier draw, likely due to the design of the built in adapter and center post. Performance wise, the chrome Lavatube doesn’t offer anything that the original didn’t. In appearance, however, it is quite an improvement. Looks aren’t everything, but shiny chrome wins over dull black in my book. And the addition of the built in eGo adapter alone may be enough to recommend this new Lavatube. The chrome version is available at Volcano for $79.99, or $10 more than the previous models yet still less than $100.